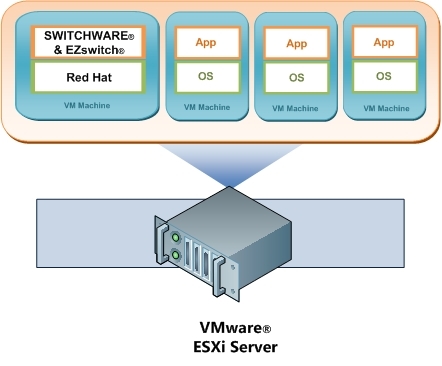 Using VMware® offers SWITCHWARE® & EZswitch® customers benefits for system redundancy, reliability, and security while consolidating hardware needs at the same time. What is a virtual machine (or virtualization)? A virtual machine (VM) is a completely isolated operating system installed “virtually” within another operating system. It is an abstraction of the computer hardware that allows a single machine to act as if it were many machines. Virtual machines are regarded as software implementations of separate machines that act like physical machines but are not physically tied to one another. They can be transferred between physical machines seamlessly, so long as the physical machine can support the virtual emulator or playing software, like VMware. Today’s IT intensive enterprise must always be on the lookout for the latest technologies that allow businesses to run with less hardware resources while providing the infrastructure to meet today and future customer needs. Server Consolidation. Businesses are able to consolidate their physical servers into one physical machine with multiple virtualized machines. Although a server supporting many VMs may require more memory, CPUs, and other hardware, it will use little or no more power and occupy the same physical space reducing utilities costs and real estate expenditures. Resource Management. Without virtualization, a single operating system owns all of the hardware resources, but with a virtualized system, multiple operating systems are able to share hardware resources. Resources can be prioritized and reallocated based on the system’s load and demand. Testing and Development. Virtualization enables rapid deployment by isolating the application in a known and controlled environment. Unknown factors such as mixed libraries caused by numerous installs can be eliminated. Severe crashes that require hours of reinstallation now take moments by simply copying the virtual image. The Ability to Use Snapshots. A snapshot preserves the state and data of a virtual machine at a specific point in time. If a change occurs, such as a new patch implementation, taking a snapshot beforehand will allow the user to roll back to the snapshot point if any problems occur after the upgrade. VMware vMotion. vMotion is a state of the art tool available with VMware. vMotion allows virtual machines to move between physical machines while they are still running. VMware offers a turnkey, all-in-one clustering solution that eliminates the need for purchasing database-level or OS-level clustering solutions. Improved System Reliability and Security. Virtualization of systems helps prevent system crashes due to memory corruption caused by software, like device drivers. Virtualization allows for directed I/O architecture, a method to provide better control of system devices through DMA and interrupt remapping. This process ensures improved isolation of I/O resources for greater reliability, security, and availability. How can I virtualize SWITCHWARE® or EZswitch®? For new customers, SWITCHWARE or EZswitch can be implemented into a virtual machine from the beginning of the software conversion process. For existing customers, SWITCHWARE or EZswitch must be migrated from the existing production environment to the new VM environment. This is accomplished by first determining the operating system and database being used by the customer. VMware supports virtual machines with guest operating systems of Windows or Linux. Customers using other server operating systems must convert their database and system over to the Red Hat Linux operating system built on the virtual machine. For AIX and Solaris-based customers, a new virtual Linux guest machine is built using CSFi’s kick-start process. CSFi will then use a conversion tool to extract the database from the customer’s current SWITCHWARE or EZswitch environment and migrate it to the new virtual machine. For Linux customers the process is much simpler. CSFi uses a disk-imaging tool to migrate the existing Red Hat Linux server from a hardware platform to a virtual file that can be run on the VMware server. Contact CSFi and learn more how you might be able to migrate to a virtualized SWITCHWARE or EZswitch system.